Then I saw myself walking with an angel of GOD, we entered a very beautiful room. There were several angels there, then I saw all kinds of musical instruments, pianos, guitars, flutes, trumpets etc, the angels began to play, they began singing, I decided to join it, it was incredible music I have ever heard. Then the LORD ministered to me that during worship, it is time to take your eyes away from anything else, your problems, achievements even your own self, you put your focus absolutely in GOD, You begin to ponder, meditate on HIS Greatness, you fill your mind with GOD’s thoughts and words of praise & adoration will start to fall from your mouth. I decided to focus on GOD, as my worship was getting perfected, suddenly I saw gemstones appearing all over the room, there were diamonds, rubies, sapphires, clear, well cut and perfect precious stones, white feathers started falling all over the room, the angels just continued worshipping, I wanted to ask, but I saw they were busy on worship, I noticed my spirit starting to rise, the angel took me away, we went through the wall of the room, we started travelling over GOD’s creation at a very rapid speed. We started flying over the earth, we flew over a certain path, then over trees and grass, we flew over the mountains and hills, valleys, flowers, we saw animals, birds, a beautiful earthly scenery. Then we flew above cities and towns. Just so fast than you can imagine. We flew over a large ocean, I was so close, I was seeing the water moving as beaten by winds, suddenly we were not flying there any more, but it changed and below us was like a large sea of fire, red, liquid fire, magma of some sort, and fiery red. It looked like it has no beginning or end, or let me say I couldn’t see the beginning or end of it, fire as far as the eye could see, I knew it was deep also. It was a terrifying scene.I knew it was the lake of fire, where sinners will spend eternity. Then we left that place, we appeared on another, here we saw giant red flames, and cells, the fire was continually burning, I saw the devil with his demons around him, they held long and large sharp instruments, I knew they use it to torment souls in hell. Quickly, we flew away into the skies, I saw the whitest and pure cloud ever, never seen white like that on earth, then an opening or a portal, then we flew through it. Looking on the sides, was this glorious white cloud. Then I saw the LORD JESUS seated down in all HIS majesty, HE wore a flowing and glorious robe, HE sat on a majestic golden throne. I saw angels on white, many had wings, the wings were outstretched, looked like birds’s wings but large, white and beautiful, the angels were standing there as if awaiting HIS Instruction, there was a white cloud, then surrounded by light and blazing fire. The scene was so spectacular. I was so overwhelmed. After meeting the LORD, we started flying around heaven at a tremendous speed, a very beautiful and pure place, with golden streets, transparent light, mansions, many angels moving about. Words are insufficient to describe that place. After that we were flying towards the earth, then I saw myself entering my body. 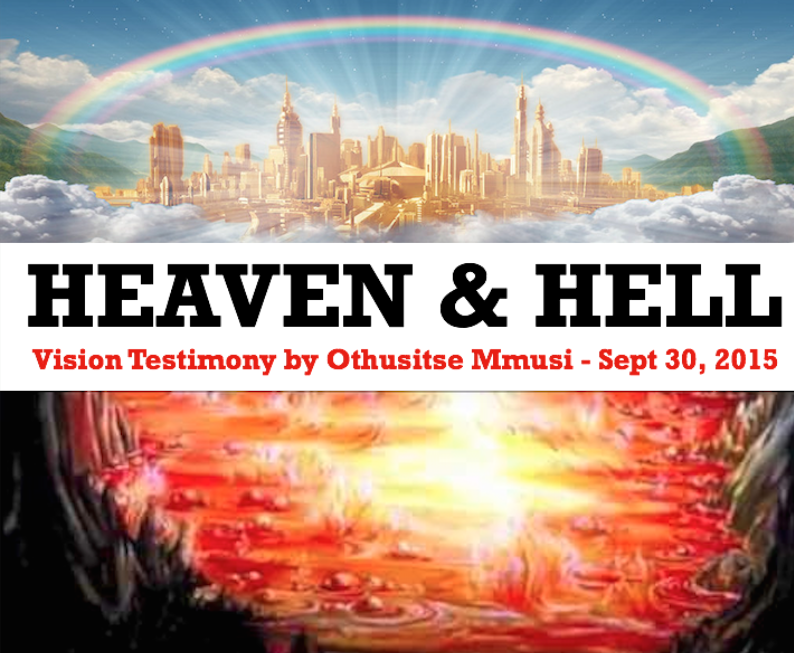 ** Brother Othusitse lives in Botswana and has been called by the LORD to see and experience the eternal realities of Heaven and Hell and End Times to help prepare the church. Connect with him on his Facebook page.